Proclaim your exultations with this beautiful collection of music that accentuates Mass and offers inspirational messages of faith from Father Michael Joncas. Remastered for the highest quality sound, this classic collection is now available on CD! 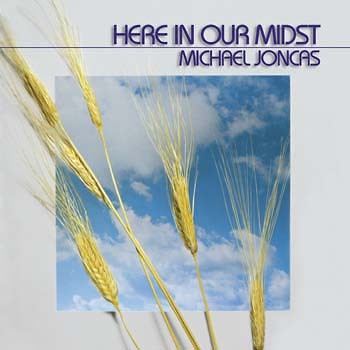 Here in Our Midst, one of Michael Joncas' most popular early collections, provides psalm settings, songs for general use and beautifully written service music, including a Gospel acclamation, memorial acclamation, doxology, holy, institution narrative and Lamb of God. Highlights include a meditative song for Christmas and gorgeous settings of Psalm 42, "Just Like a Deer," and the Magnificat, "Sing Out, My Soul." For "What Is This Place?," Father Joncas set an evocative poem by Huub Oosterhuis to a traditional Dutch folk-tune by Bernard Huijbrers. Includes parts for choir and solo instruments. One of Father Joncas' most popular early collections, Here in Our Midst provides a blend of music for a variety of occasions. Featuring psalm settings and songs for general use, this collection also contains a variety of service music, including a Gospel acclamation, memorial acclamation and more. Father Joncas' rich compositions will accentuate any Mass, allowing the faithful to truly sing the liturgy. Additionally, we are also blessed with a number of original compositions brilliantly inspired by the word of the Lord. “Just Like a Deer” captures the spirit of Psalm 42, while “What is This Place?” mixes an original poem by Huub Oosterhuis with a traditional folk tune by Bernard Huijbrers to create an entirely new arrangement. The accompanying songbook allows your musicians to support the song of your assembly, while the music guides all the faithful into deeper reflection upon the word of the Lord. Note: Contains some Mass parts that are no longer approved for liturgical use.